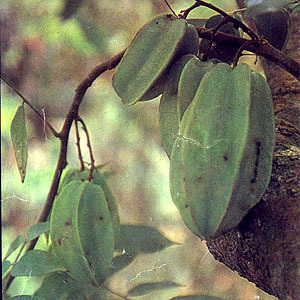 Balimbing – Scientific name: Auerrhoa carambola L.
Vermifuge, laxative, refrigerant, antiscorbutic, febrifuge, sialogogue, antiphlogistic, stimulant, emmenagogue, anodyne, emetic. Edible fruit is a source of iron (low in calcium) and vitamins B and C, oxalate and potassium. Tea of boiled leaves used for aphthous stomatitis. Crushed shoots or leaves used externally for headaches and ringworm. Boiled flowers used to expel worms: 50 gms to a pint of boiling water; drunk in normal doses. Decoction of fruit, 50 gms to a pint of boiling water, 4-5 glasses a day for bleeding piles. Juice of fresh fruit for affections of the eyes. Seed is used for asthma and colic: Powdered seeds, 10 gms to a cup of warm water, drunk 4 times daily. This entry was posted in List of Medicinal Plants in the Philippines and tagged balimbing on March 8, 2009 by Pinoy Herbs.